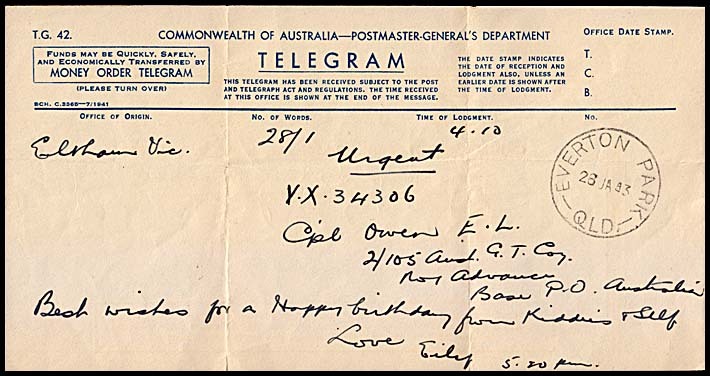 Australia - War years and recovery: 1940-1957. Ordinary rate delivery form: AW-DO-9. Heading and notes: Form T.G. 42 in top left corner. Only one boxed advertisement in heading. 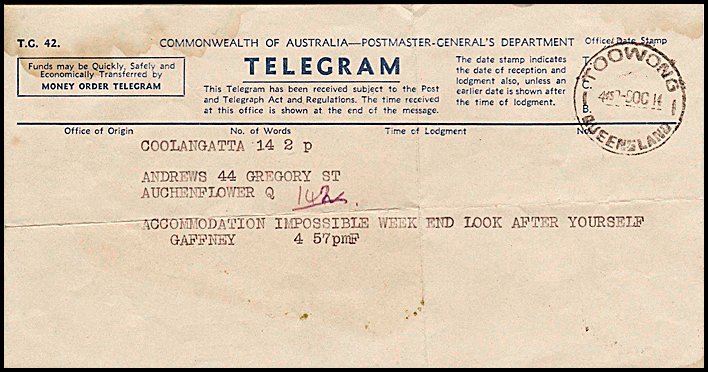 TELEGRAM below one line C of A heading. COMMONWEALTH extends well over LH box. Has three distinct sections in heading. Reverse side: Advertisement (on first printing only) or blank (see below). Size of form overall: 100 × 190 mm (approx). "Turn over" Schedule number Gap between left box and Schedule number. 9Ba Present inside the box and an advert on reverse. Sch. C. 2941 - 9/1940. 9Bb None Sch. C. 3873 7/1942. 9C Present outside the box and an advert on reverse. Sch. C. 3365 - 7/1941 Yes and Schedule number is in small font. 9Ha None S.P.L. - A834 - 6/1942. Schedule number starts S.P.L. Printed in September 1940. AW-DO-9A. 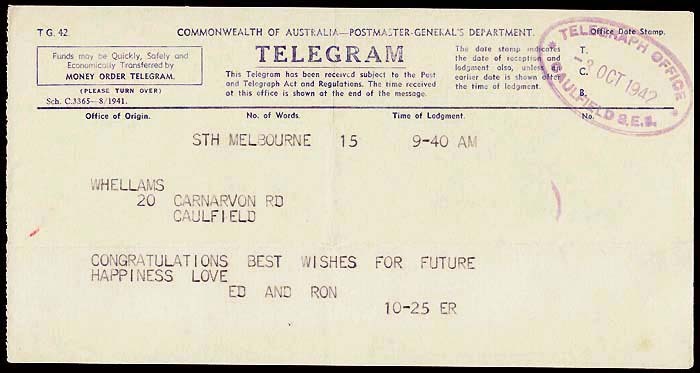 probably has advertisement for "Birthday Greetings ..." printed in orange on reverse but reverse side not cited. 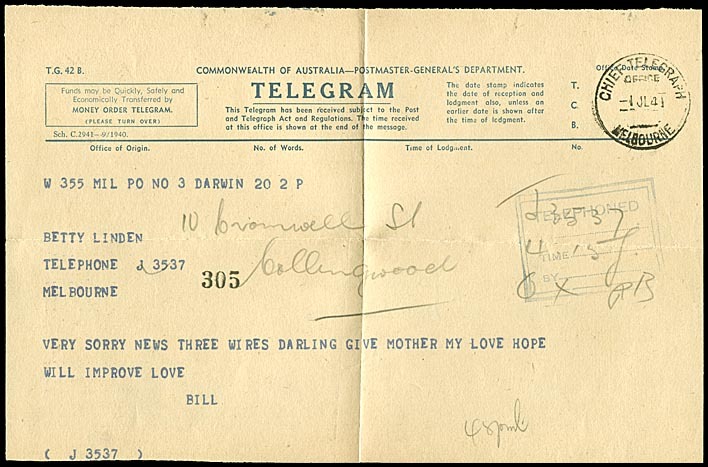 Very special telegram commenting on a most important naval event. Puckapunayl (sic) Mil PO to Camberwell E.6. 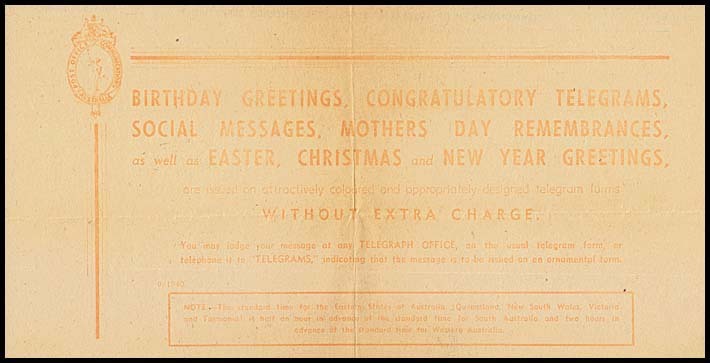 has advertisement for "Birthday Greetings ..." printed in orange on reverse (see below). 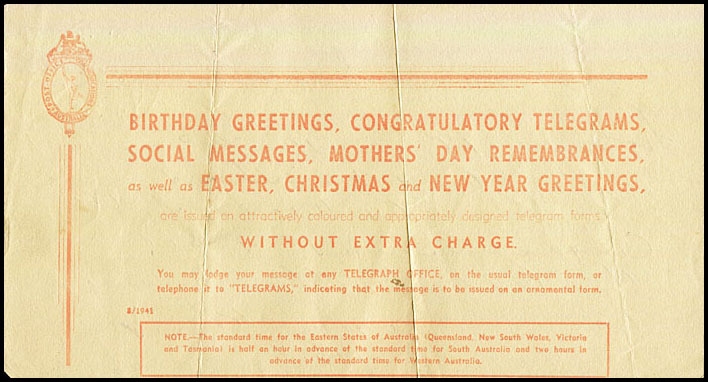 Reverse side of the above delivery form to Camberwell showing single advertisement in orange for "BIRTHDAY GREETINGS ...". 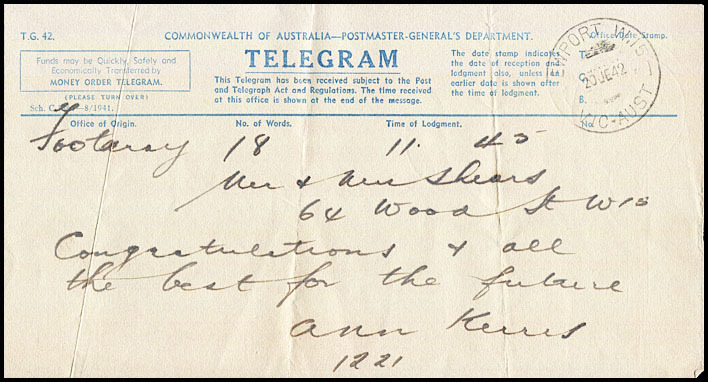 Note in box concerns the time differences across the states. ... FULLY ADDRESS ... with ARMY example. 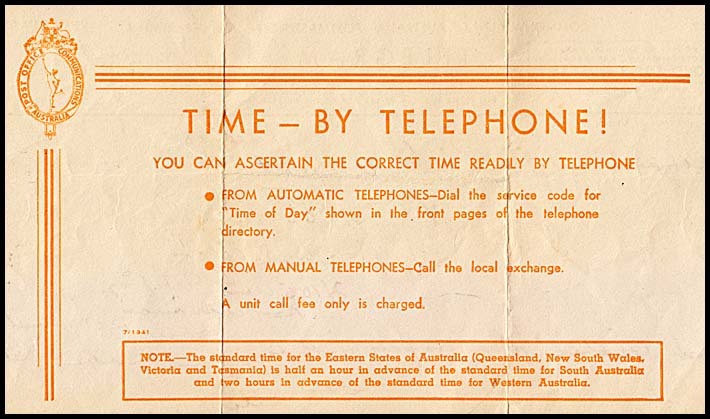 Printed in September 1940 same as for AW-DO-9A above. AW-DO-9Ba. "Commonwealth ..." stops before the right edge of the box and is 100 mm wide. reverse side has "BE SURE TO FULL ADDRESS ..." in orange. "BIRTHDAY GREETINGS ..." in orange. Printed in July 1942. AW-DO-9Bb. 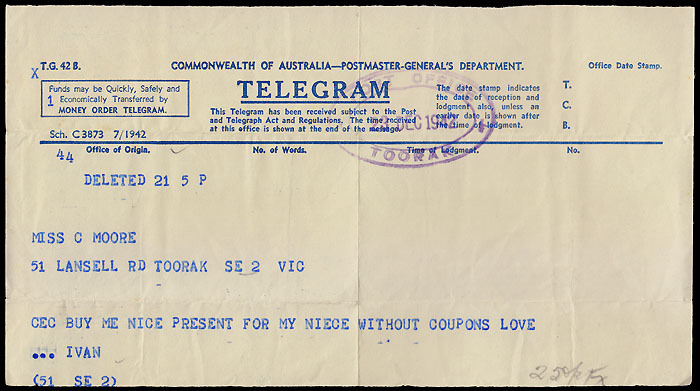 no advertisement on reverse side. Printed in July 1941. AW-DO-9C. 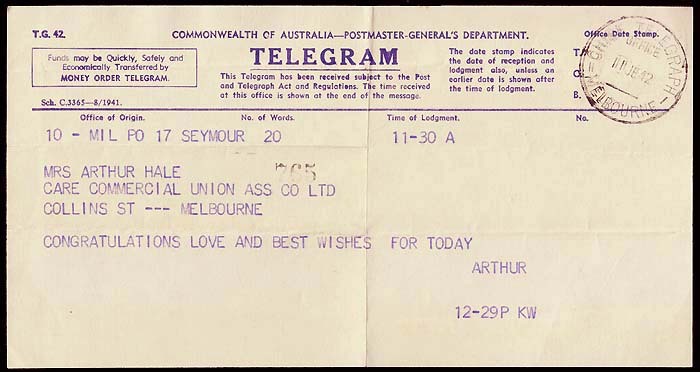 AW-DO-9C (reverse side of Everton Park telegram). 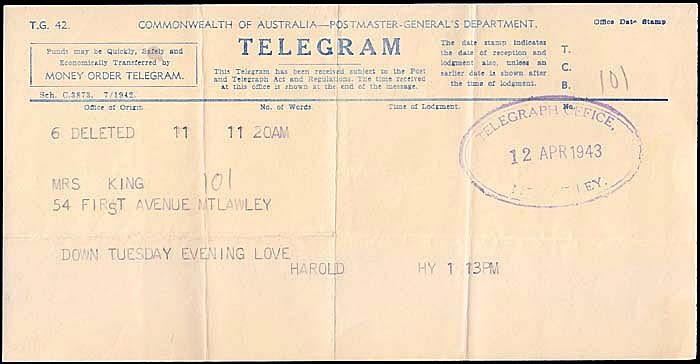 has printing date for reverse side is also 7/1941. Printed in August 1941. AW-DO-9D. no space between the instruction and the schedule number. has printing date on the reverse side and it is also 8/1941. Printed in August 1941. AW-DO-9E. South Melbourne to Caulfield S.E.S. (3 October 1942). Printed in August 1941. AW-DO-9Fa. the reverse side is blank. Printed in July 1942. Cut at a significant angle. AW-DO-9Fb. no gap between the box and the schedule number in the top left. "No." moved to be 1 mm to left of T/C/B. 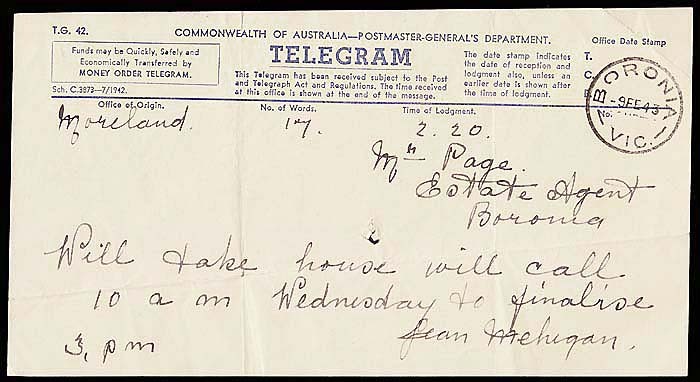 This type of schedule number has not been previously recorded but two are known at Alberton on the same date. AW-DO-9Ha. 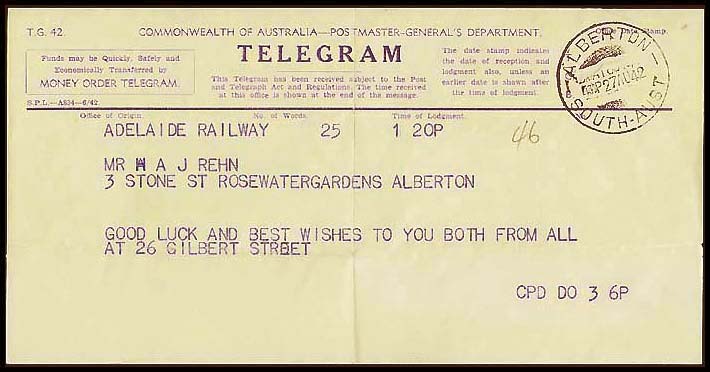 Adelaide Railway to Alberton, SA (27 August 1942). 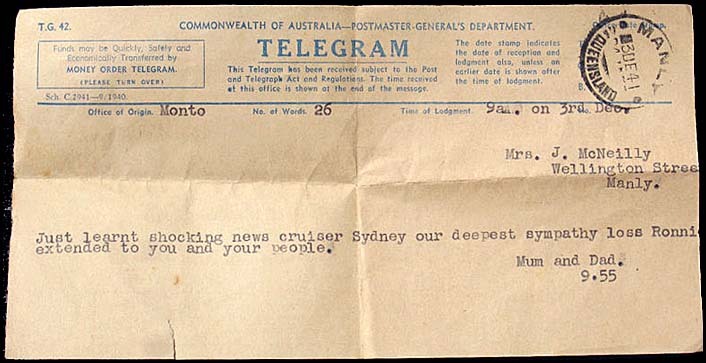 letters of TELEGRAM are spread out (45 mm wide rather than 39 mm wide as for DO-9E). Printed in July 1942. AW-DO-9Hb. Mt. 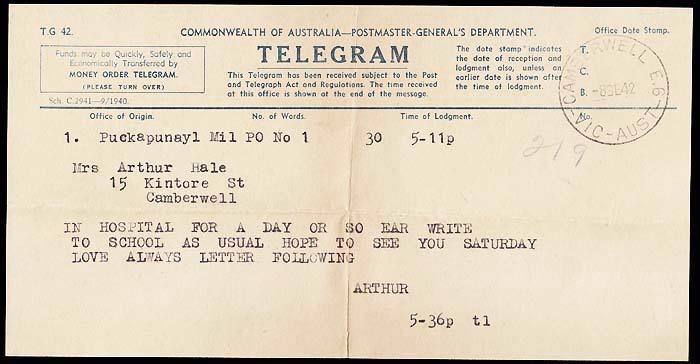 Lawley (12 April 1943) . Previous ordinary rate delivery form (AB-DO-8). Next ordinary rate delivery form (AW-DO-10).